Here again is another story of the adventures of the irrepressible Penny Parrish and her delightful family. By one of those happy accidents best known to fiction, Major Parrish has been transferred from Fort Arden, Kansas, to West Point, where all concerned can keep an eye on David, the family's cadet. And happily, Penny's friend Carrol Houghton lives in an enormous barn of a place not far up the Hudson from the Point. So it is not surprising that the two girls are together constantly. There's excitement from the very beginning when the Parrishes visit the Houghtons at their New York penthouse, and attend the Army-Notre Dame football game. Penny--who can get herself into more jams than anyone else--gets lost in the crowd, and by chance meets a famous actress. This adventure definitely decides Penny on a career in the theatre. And it does seem that this time Penny's mind is really made up! There is near tragedy for Penny's brother David, which luckily ends happily. But besides that, the winter for Penny is a delicious whirl of hops at the Point, a trip to Florida with the Houghtons, and at last June week--and romance. Dreams of Glory picks up a mere two months after Star-Spangled Summer. The Parrish family are settling in at West Point, where David has just started school. The Houghtons are close by at Gladstone Farms, and Penny is impressed. "Penny's eyes searched the woodland as the drive wound on and on, and when an English manor house came into view, she gasped. The lower half of the house was brick; its upper, white stucco with dark-stained beams; and it stretched before her like a castle. The center section curved in an arc, and turrets divided it from long wings on either end. A haughty, semi-circular terrace warded off the driveway, and chairs and gay umbrellas were dwarfed by the tall French windows behind them. 'My goodness,' she gasped. 'I thought you had a farm house.'" Gladstone Farms also has a gatehouse, a butler, badminton and tennis courts, swimming pool, and, of course, a stable of horses. Side note: I am obsessed with the stately homes advertised in the back pages of the Sunday New York Times Magazine. This might be why. 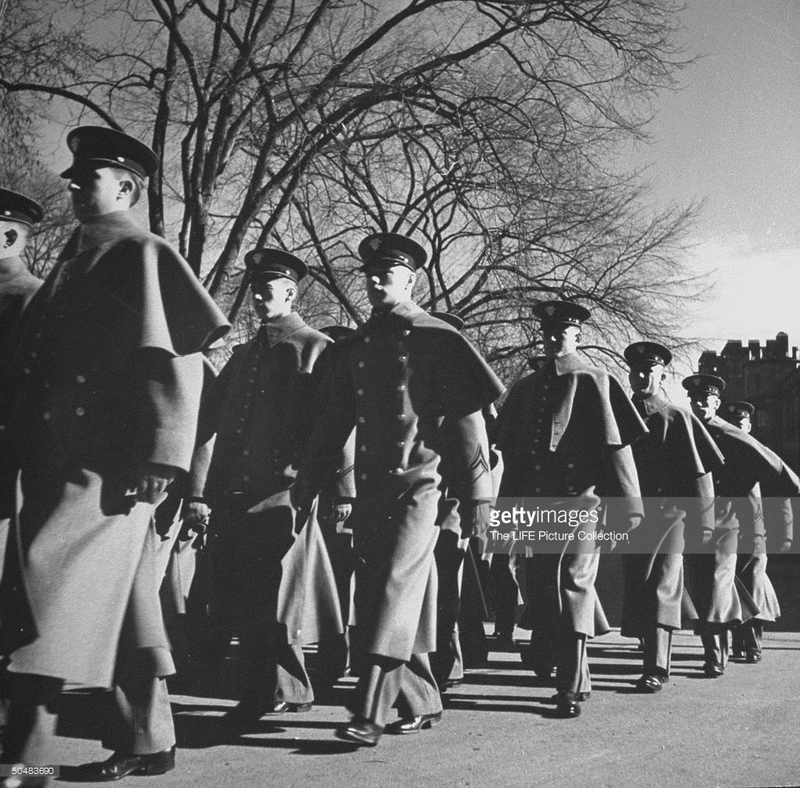 West Point cadets marching to mess in 1942. Penny gets lost in New York City, saves a famous actress from being hit by a cab, sees her show, has dinner with her at Hardy's, a famous night spot, and ends up even more determined to become an actress. The handsome Lieutenant Hayes stops by to create a little trouble between Carrol and David, and with Penny. 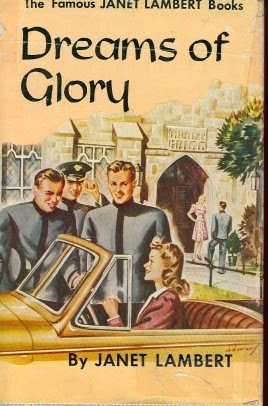 Much of the action of Dreams of Glory is about David's first year at West Point, and, his hazing. One of the fascinating elements of all the West Point talk is how strange some of the language is, and how hyper masculine manhood of today seems in comparison. For example, the cadets' roommates are referred to as 'wives.' and there's a lot of talk about blouses. It just sounds so unusual. WHAAAT? Back we go to West Point, where David is in the infirmary with some sort of stress-related blindness from reading too much and studying too hard. And guess who's there? The evil Louise, who beats it when Penny and Carrol show up. After a fair amount of time spent in the infirmary, David regains his sight and is on the mend. Penny hosts a dinner party on New Year's Eve, and the crowd goes to a dance. The girls wearing gorgeous dresses of "red slipper-satin" and "pink chiffon", and "floated down the stairs, evening sandals flashing under their trailing skirts." "The boys wore their full dress, chests and coat tails gleaming with brass buttons." A 1941 company in full dress. Before we know it, June Week and the Graduation Parade is upon the Parrishes. "Its [The Thayer Hotel] lobby was filled with girls, bright in dirndls and prints, always dashing in or out, rushing to meet cadets who wore the special June Week uniform of white trousers and gray full-dress coat, with smart white cap above it. They danced away the tea hours, caught hurried swims at Delafield; and there was never a vacant table in the Boodlers'." Finally, the actual Graduation Parade is here. 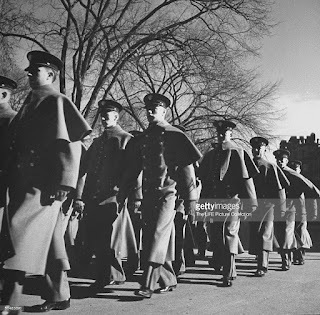 See below for an image of a Graduation Parade from a site about Air Force Major General Ernest T. Cragg, who was at West Point at about the same time as David Parrish. The caption of the Ernest Cragg photo reads: "'So long,' we whispered as the command 'Graduating class, front, center march!' was given. We marched out of the United States Corp of Cadets and the yearlings took over. With that command, the graduating firsties separated from brigade. They left their companies [and] marched to the reviewing side of the Plain to receive the 'Pass in Review' that ended the parade." But David has one more errand for Carrol before Graduation Week is over. David leaned against a tree and laughed. 'Which way shall we go?' he asked. 'Well, glory, I don't know,' Carrol thought with a shudder of the Kissing Rock. Tradition decreed that no girl must pass, unkissed, beneath it. Somewhere it hung, above one path or the other, solid in the cliff, and waiting to surprise a novice. She looked at David but he was only cocky against his tree. Long story short, they end up at the Kissing Rock, where there is (a small amount of) kissing, and David gives Carrol a "small gold pin that was nestling on white velvet. Its A, that stood for Army, was pearl-encrusted, and three diamonds twinkled from its points" and some discussion about whether Carrol would want to be a second lieutenant's wife. (Spoiler: She would.) All ends fairly happily. "No, I'm not worryin' about you, neither; not when you stop your play-actin'. The trouble with you is you got a heart that's too big for your body. But you gotta learn to manage it. Your heart says 'I'm mighty unhappy. Let's don't eat.' So you don't eat. Then the rest of you gets all out of fix. Your mind cain't work right, no more than a car can run without gasoline. Your nerves is a-jumpin'--an' first thing you know, your heart's runnin' everything an' your body jes' sets down an' quits. You mustn' let that happen, honey." The relationship between Carrol and David progresses quite slowly, as David is busy at West Point. Carrol is being brave and patient. Plus, the hazing at West Point is kind of unnerving, even though it's all verbal and emotional rather than physical (thank goodness). And there's not much interaction between all of the gang who so richly populated Star-Spangled Summer. But fear not: things pick up much more in Glory Be!